Ummmm. Did ya find what you were looking for? Hey, if anyone can think of a good caption for this pic, post it up. This picture is just too much! 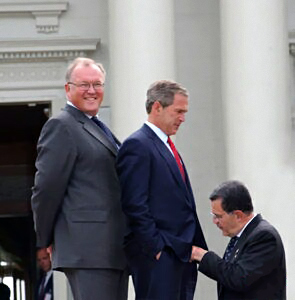 I think the guy who appears to be getting up close and personal with Bush’s bush is probably just zipping him up. Like his mommy. Perhaps it’s his assistant. I don’t think the large man sporting the grin is supposed to be there. This picture is just great! I’m adding you to my bloroll as well, so that I won’t loose the next embarrassing picture of my representatives! I love this one. Am I in trouble for posting this? Next Next post: Never Complain About YOUR Bad Luck Ever Again!